News from LMCU: Reboot high-interest credit card debt! Reboot high-interest credit card debt! If you carry a significant credit card balance from another institution at a high interest rate, you can restore some financial sanity by transferring that balance to a new Max Rewards Visa credit card. You’ll get 2.99% APR* interest for 12 months on any and all transfers, and variable rates as low as 10% after that. It’s a great way to consolidate debt and avoid high interest rate charges. This balance transfer offer also applies to new Prime Platinum credit cards. 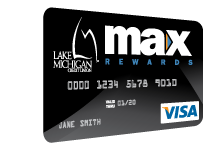 Not a Max Rewards Card holder yet? You should be. Apply today at (616 or 800) 242-9790, online at lmcu.org, or by visiting any branch location. *APR= Annual Percentage Rate. Applies to new accounts only, opened between Aug 1-Sept 30, 2013. 2.99% on balance transfers for 12 months from opening date. Rates and approval dependent on credit profile. Existing LMCU loan balances are not eligible. Promotion does not include purchases. Regular card rate applies to any new purchases.